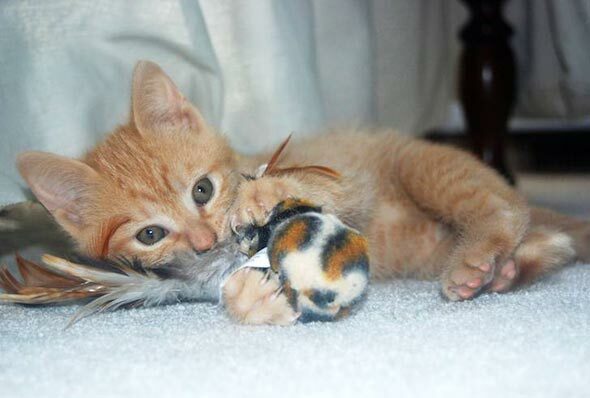 Carly says: OJ, named for his orange color, is the first kitten I have ever adopted. I had wanted an orange kitten for a while, and after hearing about OJ, I couldn't say no. OJ is quite fearless, chasing and taunting the dog, introducing himself to visitors, and trying to play with any cat he meets. He has a tendency to take all of his toys and stash them under the couch. When I let him sleep in my bed, he insists on sleeping next to my face on my pillow, and letting me know how happy he is with his super-loud purr. OJ, you're an orange beauty with room to explore. So glad OJ is having such a great time!!! He sounds like a true orange tabby - friendly, lively and loving!!!!! O J is a little Orange Jewel! Love how sweet he looks while napping. This little dude looks very cool.